महाराणा प्रताप, a Sixteenth century राजपूत ruler and great warrior of his time. Mughal Emperor Akbar sent many missions against him; however, he survived and fought to his last breath. He ultimately gained control of all areas of Mewar, excluding the fort of Chittor. अनंगपाल तोमर अनंगपाल दिल्ली के तोमर वंश के संस्थापक थे। अनंगपाल सिंह तोमर (क्षत्रिय कुल) से ७३६ ईस्वी में इस तोमर राजवंश की दिल्ली के लालकोट में स्थापना की थी. हर्षवर्धन A Bais Rajput King of Vardhan dynasty who ruled Northern India for fifty seven years between 590 CE-657 CE. Jayapala, the Hindushahi ruler of Northwest India, Pakistan and Eastern Afghanistan. बप्पा रावल, First Gehlot king at Chitrakut(Chittor), Defeated Muslim Invaders from Iran. Followed his Parmar Uncle to throne of Chittor. राणा कुम्भा, Glorious ruler at Chittor in 15th century, built many palaces, never lost a battle. 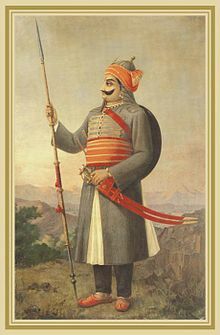 महाराणा प्रताप,one of the great warriors of Rajputana, Last and only Hindu Ruler to defy mughals. Titled - Chattis Rajkul Shringar, Hinduvi Suraj Hindupati for his bravery and for being the last torch bearer of Hinduism. राव शेखा, King of Amarsar, The Shekhawat sub-clan of Kachwaha Clan of Jaipur is named after him. one of the great warriors of Rajputana. Rana Hamir-Ruler of Mewar, Saviour of Gehlot Sisodia clan. Rana Sanga-Ruler of Mewar and regarded as greatest warrior of India. Amar Singh Rathore-Nephew of Maharana Pratap. Thakur Ranmat Singh- A famous ruler of Baghelkhand Agency. वीर दुर्गादास राठौर-A very famous warrior of Rajasthan. जाम रावल जाडेजा- Founder of "NAWANAGAR STATE",Saurastra. ठाकोर हरघ्रोलजी जाडेजा-A Founder of "DHROL STATE",Saurastra. ठाकोर मकनजी जाडेजा - ध्रोल राज्य पाटवी कुंवर . his named village Makaji Meghpar located in Jamnagar district. Baba Ramdevji a Tanwar Rajput and local deity of Rajasthan. Gogaji a Chauhan Rajput and Local deity of Rajasthan. Veer Kunwar Singh - Hero of 1857 revolts against British imperialists. Raja Badan Singh Bhadauria- Valiant Ruler From Bhadawar. Raja Gopal Singh Bhadauria- King From Bhadawar During Mughal Era. Vishwanath Pratap Singh-The 10th Prime Minister of India. Former Finance Minister of India, also Served as Chief Minister Of Uttar Pradesh. भैरों सिंह शेखावत - Former Vice President of India. Also served Three times Chief Minister Of Rajasthan from BJP party. Bhakt Darshan(Singh Rawat)Former Union Minister Govt. of India. He is one of the few Indian politicians to have been the Minister for Defence, Finance and External Affairs. Arjun Singh - Senior Congress Leader. Minister for Human Resource and Development . Served 2 Times as chief Minister of Madhya Pradesh. Maharani Gayatri Devi Won the constituency in the Lok Sabha in 1962, 1967,1971. Rajnath Singh - President of BJP. Also served as Chief minister of Uttar Pradesh. Digvijay Singh Former Chief Minister under Madhya Pradesh. He is the general secretary of the Samajwadi Party and a member of the Rajya Sabha. Bhupendrasinh Chudasama-Misiter of Education of Gujarat. Raman Singh - Chief Minister of chhattisgarh from BJP party. He has been chief minister since December 7, 2003. Won State elections for the second time. Digvijay Singh-former rail minister state and won from Banka, Bihar. Virbhadra Singh - Former Chief Minister of Himachal pradesh from Indian national Congress. Shankersinh Vaghela- Former chief minister of Gujrat and Honable textile minister India. Shivraj Singh - Chief Minister, Madhya Pradesh. Dilip Singh Judeo - He was the Indian Minister of State for Environment and Forests. Madhav Singh Solanki - Former Chief Minister of Gujrat. Shankersinh Vaghela - Former Chief Minister of Gujrat, Current Union Minister or Textile. Nareshchandra Singh - Former Chief Minister of Madhya Pradesh from Indian National Congress. Kalikesh Singh Deo - Member of Parliament from Saintala Assembly Constituency. Kalyan Singh Kalvi - He was cabinet minister in government of India in 1991 with portfolio of energy. Major Shaitan Singh Bhati. Awarded the Param Vir Chakra, the highest gallantry award posthumously during the 1962 Indo-China war. Brigadier Ransher Singh Ranawat. Awarded the Kirti Chakra and Sena Medal for separate events during the 1971 India-East Pakistan/Bangladesh war. Karni Singh Rathore - K.C. लक्ष्मी कुमारी chundawat - An author and a politician of Rajasthan.